Civil Engineering at DLSU-Manila accredited PAASCU Level IV! for being the FIRST PAASCU accredited Engineering institution in the country with LEVEL IV status. We sincerely thank the IAAQAR Council for their untiring effort in pursuing this accreditation to its successful conclusion. Likewise, thanks for the full cooperation of the concerned administrators, faculty, students and staff of Gokongwei College of Engineering. Three civil engineering alumni were accepted as graduate scholars under the AUN-SEED/Net program 2012. Daniel Valerio, Jamiel Jayme and Erica Uy will pursue their Master's degree in civil engineering at Chulalongkorn University, Bangkok, Thailand. Valerio will major in Structural Engineering, Jayme in Transportation Engineering while Uy will join the Geotechnical Engineering Division with now 2nd year MS student Em Sevilla. The three alumni graduated BSCE in 2011 (1st term). Congratulations and we wish you the best in your graduate studies. To produce globally competitive and socially responsible civil engineers is a major challenge to civil engineering (CE) schools all over the world. CE educators are now challenged to address issues such as the global mobility of professional civil engineers, outcomes-based education as a framework in the accreditation of schools, the use of new and advanced technology in the teaching and learning process in the university and the impact of collaboration and networking with international institutions and professional organizations. 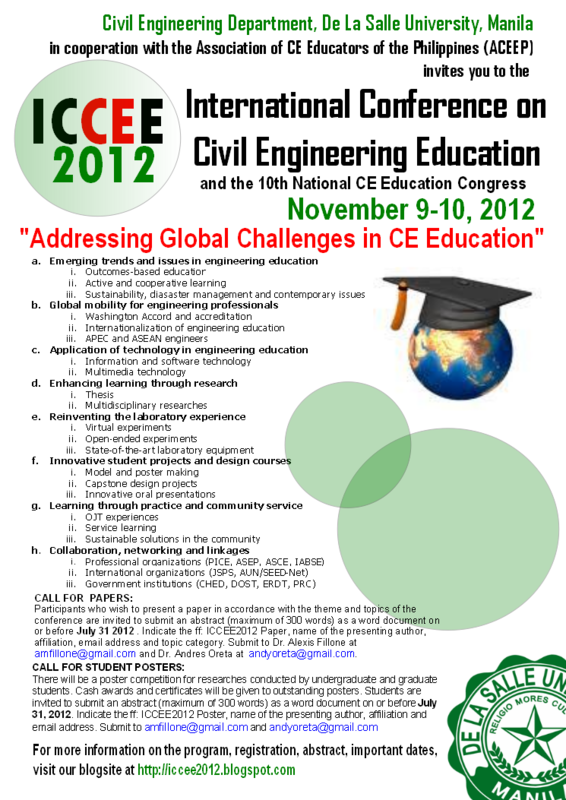 The Department of Civil Engineering, De La Salle University-Manila will host the ICCEE2012 – International Conference on Civil Engineering Education Conference 2012 with the theme “Addressing Global Challenges in Civil Engineering Education” on November 9-10, 2012. This international conference will serve as a forum for CE educators, researchers, practitioners, school administrators and students to exchange information, to share lessons and to discuss strategies on how civil engineering education can be improved to produce globally competitive and socially responsible professional civil engineers. Participants who wish to present a paper in accordance with the theme and topics of the conference are invited to submit an abstract of about 200-300 words as a word document on or before July 16, 2012. Indicate the name of the presenting author, affiliation, email address and topic category. Submit to Dr. Alexis Fillone at amfillone@gmail.com and Dr. Andres Oreta at andyoreta@gmail.com. There will be a poster competition for researches conducted by undergraduate and graduate students. Cash awards and certificates will be given to outstanding posters. Students are invited to submit an abstract of about 200-300 words as a word document on or before July 16, 2012. Indicate the name of the presenting author, affiliation and email address. Submit to amfillone@gmail.com and andyoreta@gmail.com.